The Klemantaski Collection archive describe the photograph thus; ‘Hawthorn is obviously really on the absolute limit with this Cooper-Bristol. And of course he is aiming right for Klemantaski who had positioned himself at the edge of the track exactly at the apex of the very fast Fordwater corner on the back of the Goodwood circuit. What a dynamic image! 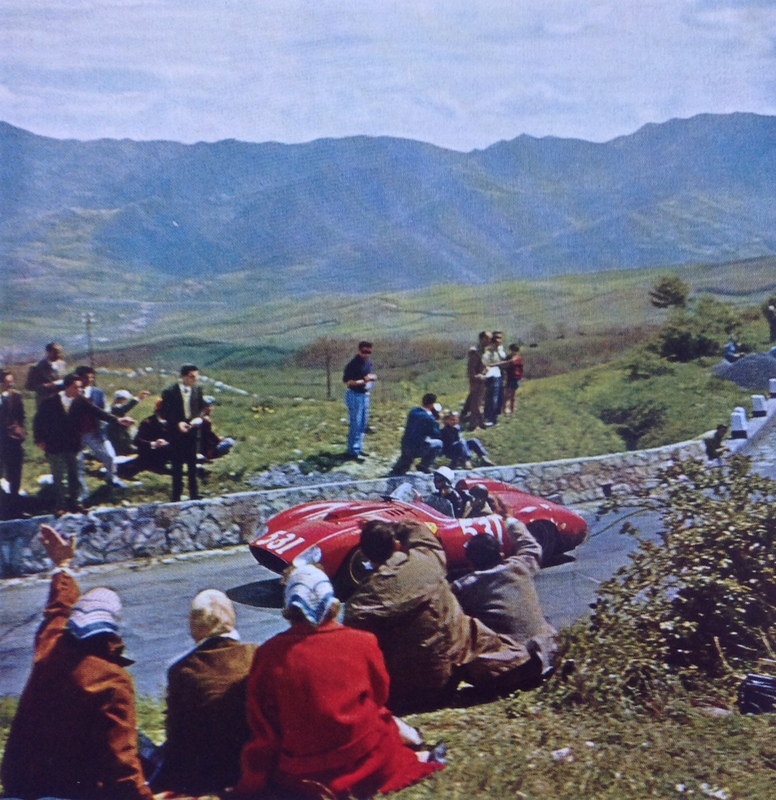 This race was the ‘Sussex International Trophy’ for Formula Libre racing cars on June 2, 1952. Hawthorn won, perhaps somewhat aided by his father Leslie’s long experience with nitromethane. It was Hawthorn’s third outing with a friend’s Cooper-Bristol. 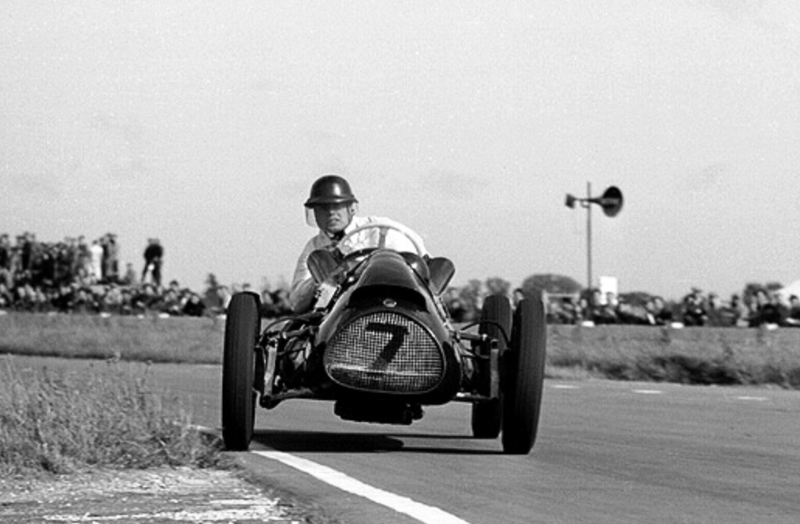 On April 14th at Goodwood he came up against Juan Manuel Fangio, driving another Cooper, and won against the already famous Argentinian driver. 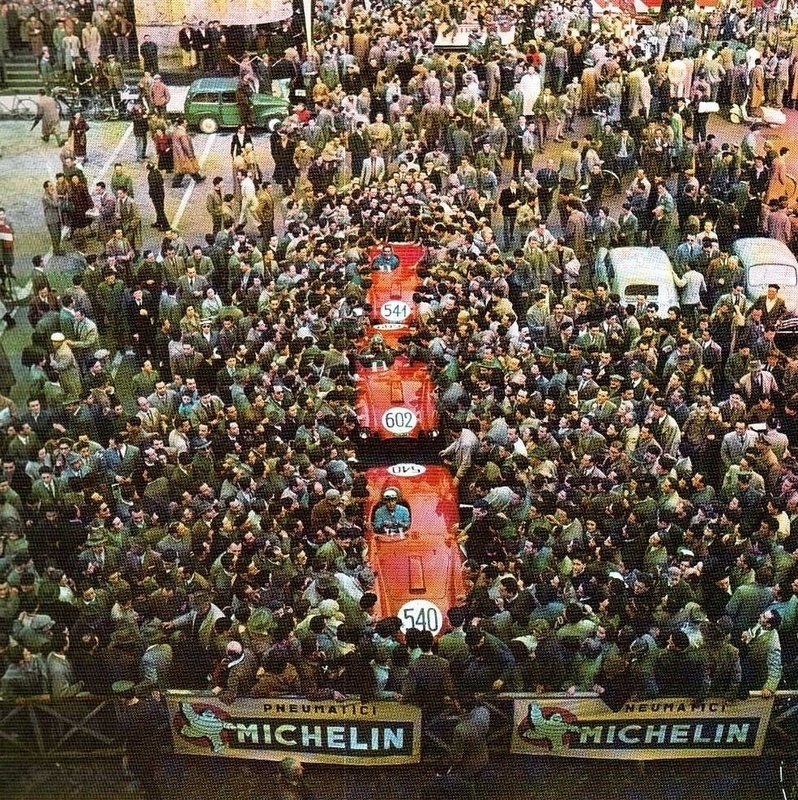 Hawthorn won two races with the Cooper that weekend and finished second in the final race of the day to Froilán González in Tony Vandervell’s Thinwall Special Ferrari GP car. 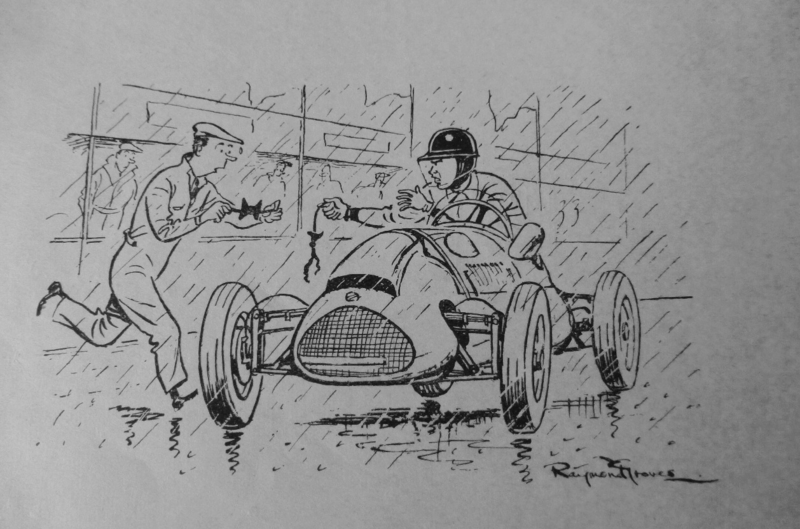 Then Hawthorn entered the Daily Express International Trophy on May 10th with the same Cooper-Bristol to win the first heat, but finished several laps down in the final due to gearshift problems. 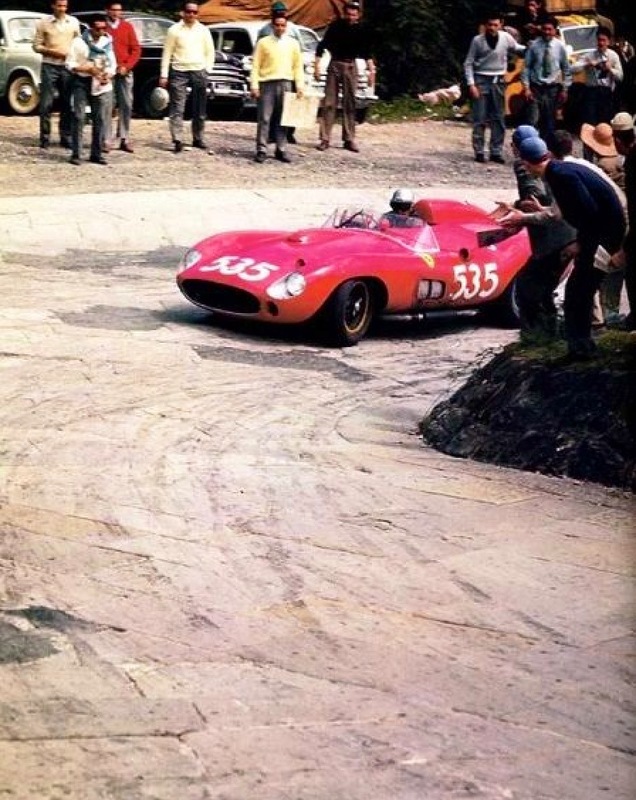 His excellent showing with the Cooper at the Belgian Grand Prix at Spa-Francorchamps where he was fourth and at the subsequent British Grand Prix finishing third led to an offer from Ferrari for 1953- and an eventual World Championship aboard the Ferrari Dino 246 in 1958. ‘Hawthorn died in a road crash in January 1959 after retiring from racing at the end of his Championship year, is remembered by his own book Challenge Me the Race and Champion Year and in several biographies, including Mon Ami Mate and Golden Boy. 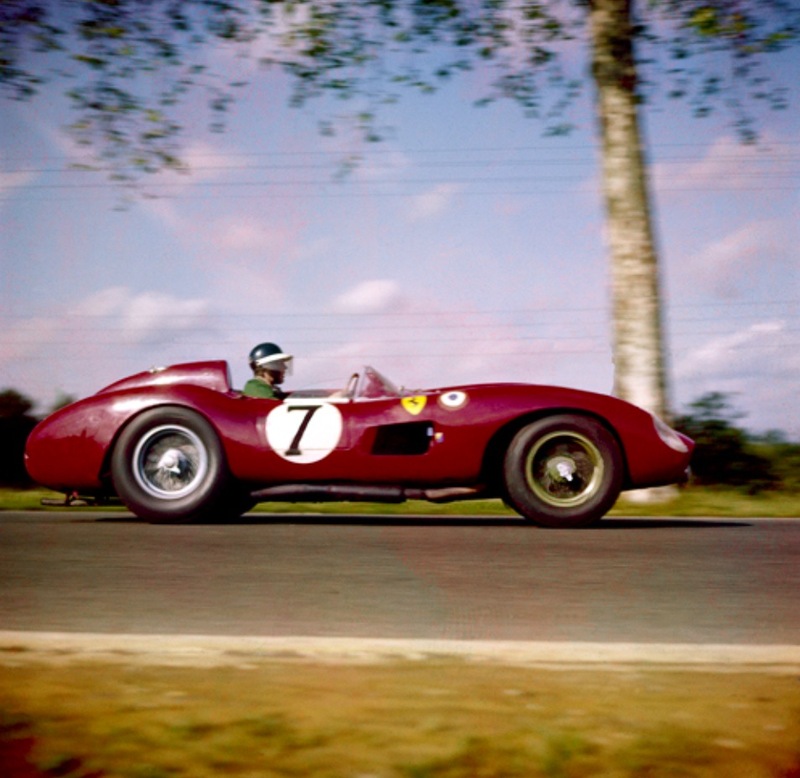 Mike Hawthorn’s grave is in Farnham, Surrey where he is still well remembered and where he and his father had run the Tourist Trophy Garage for many years’, the Klemantaski Collection wrote. 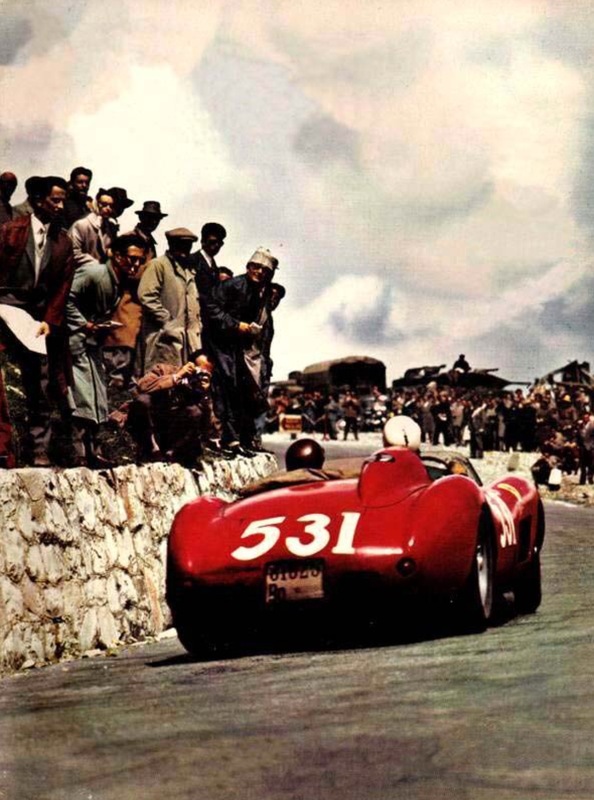 This stunning, evocative shot, one of motor racings’ most famous, was taken by acclaimed photographer Louis Klementaski who ‘navigated’ for Collins capturing the essence of the event and times which seem so long ago. 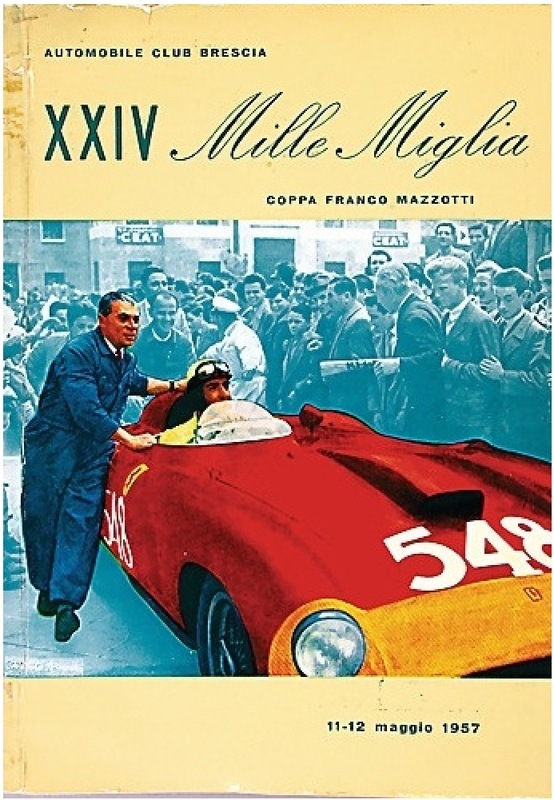 Klemantaski picks up the story in ‘Automobile Year 44’…’In the fateful Mille Miglia of 1957 I was in the Ferrari Team in the car driven by Peter Collins, a 335 Sport. This model was the ultimate achievement of Ferraris’ creativity of that period. 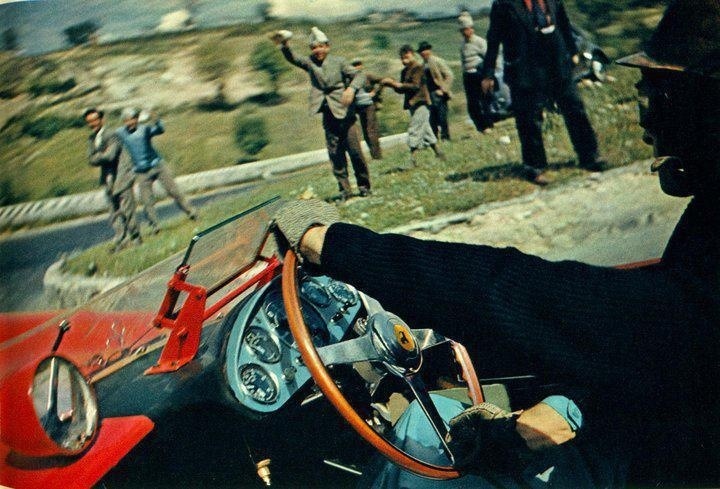 Peter said it was the best handling sports-racing Ferrari he had driven so far. It was certainly the most powerful and I had to adjust my course notes accordingly’. 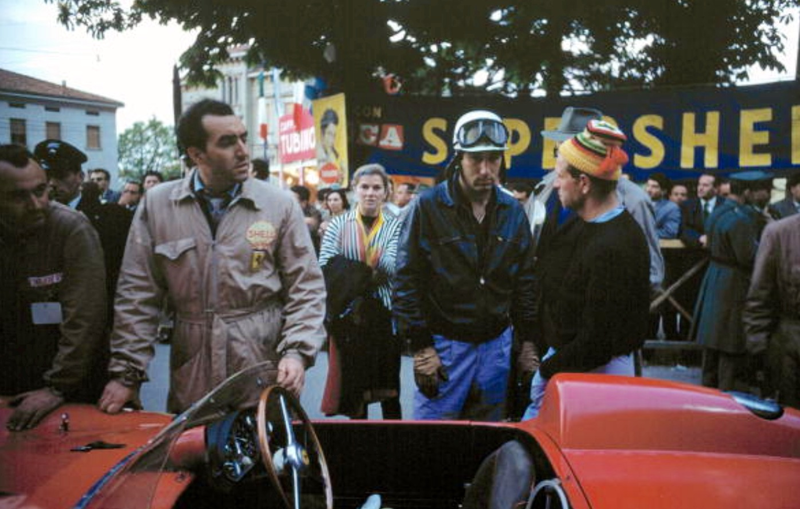 Scuderia Ferrari entered five cars in the 1957 event... 315S models for Piero Taruffi (his car fitted with a 335 engine) and Count Wolfgang ‘Taffy’ von Trips, and the latest 4 litre quad-cam 335S models for Collins/ Klemantaski and Marquis ‘Fon’ de Portago and Ed Nelson. 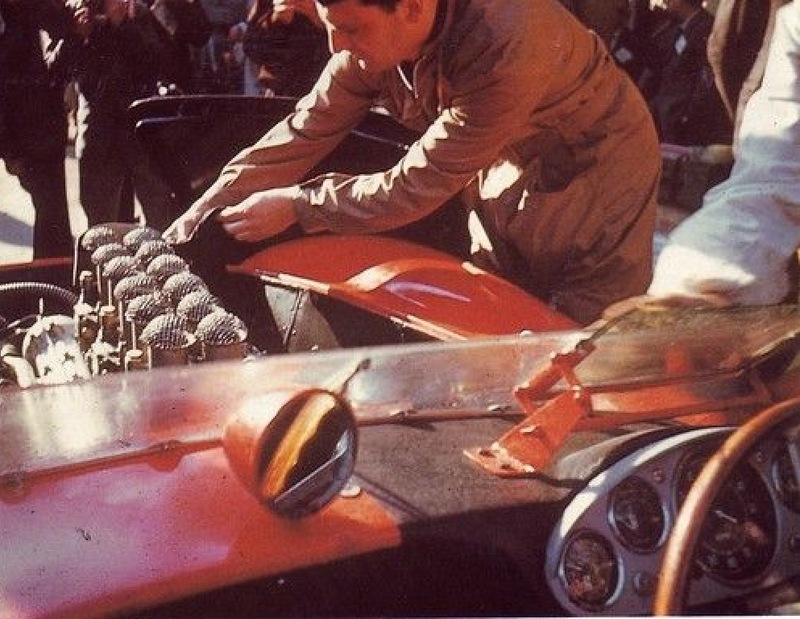 Finally, a 250LWB was entered for Olivier Gendebien and his navigator M Washer. Taruffi won the race and then retired with Von Trips in second. The Collins car retired at the 5 hour 3 minute mark with a broken driveshaft. Sadly, and infamously de Portago/ Nelson perished in a gruesome accident also which took the lives of nine spectators, five of whom were children in the village of Guidizzolo, Lombardy, 110 Km east of Milan. Some reports say de Portago should have changed his tyres earlier, a blowout the cause of the accident. 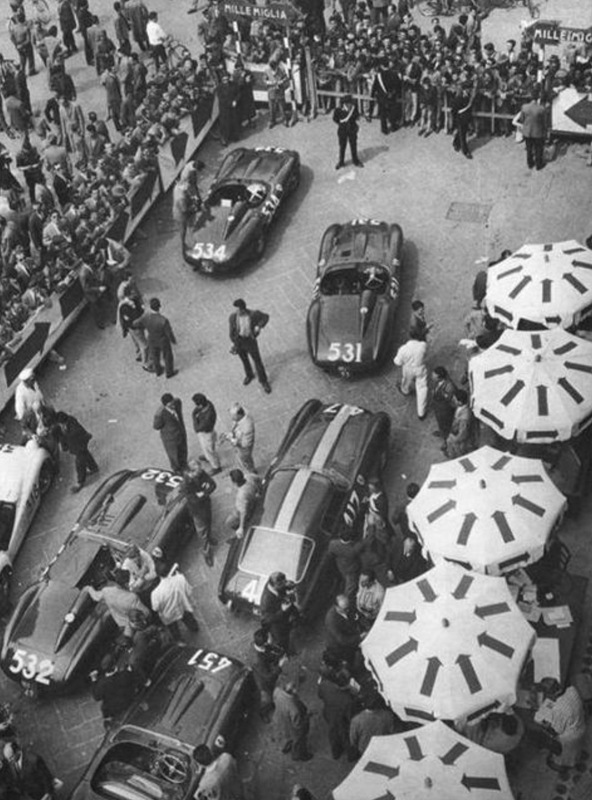 The race was banned as a consequence, and so ended a tradition which commenced in 1927, the event run 24 times from then until 1957. 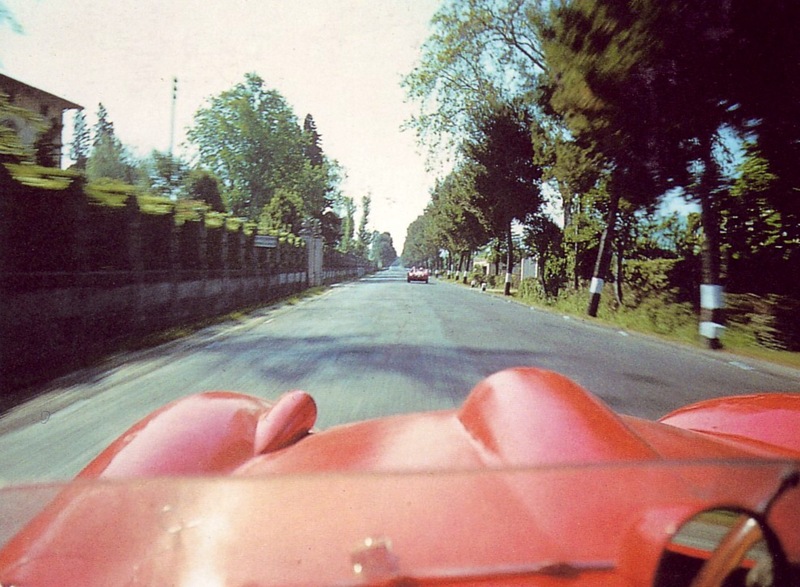 The Mile Miglia was started by Count Aymo Maggi and Franco Mazzotti… after the Italian Grand Prix was moved from their home town of Brescia to Monza. 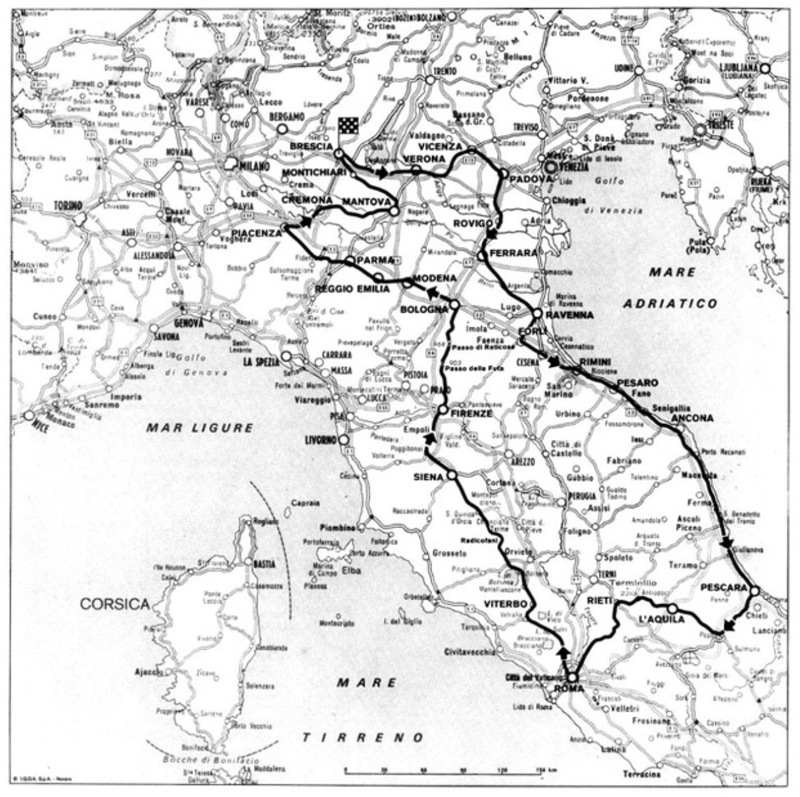 They chose a race from Brescia to Rome and back, a figure-eight course of 1500Km or 1000 Roman Miles. Various courses were used over the years with many of the greats of the day winning. Tazio Nuvolari Alfa 6C 1750 in 1930 and 8C 2300 in 1933, Rudy Caracciola in a Benz SSK 1931, Achille Varzi Alfa Monza 1934 and Alberto Ascari in a Lancia B24 in 1954 included. 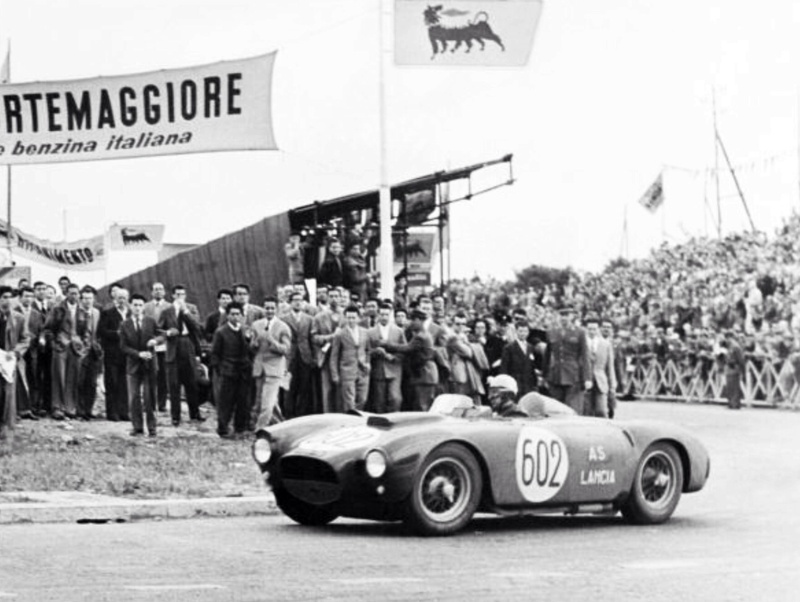 Over the years Italians won the race the most, from 1953 to 1957 the event was a round of the World Sports Car Championship, Stirling Moss famously winning navigated by ‘Motor Sport’ magazines’ Denis Jenkinson, the pair setting the fastest ever time of 10 hours 7 minutes and 48 seconds. The team covered six reconnaisance laps, Jenkinson making ‘pace notes’ on a scroll of paper contained in an aluminium housing. Dennis ‘calling’ the corners and the stunning ability of Moss resulted in an emphatic and famous 1955 victory in their Mercedes Benz 300SLR. 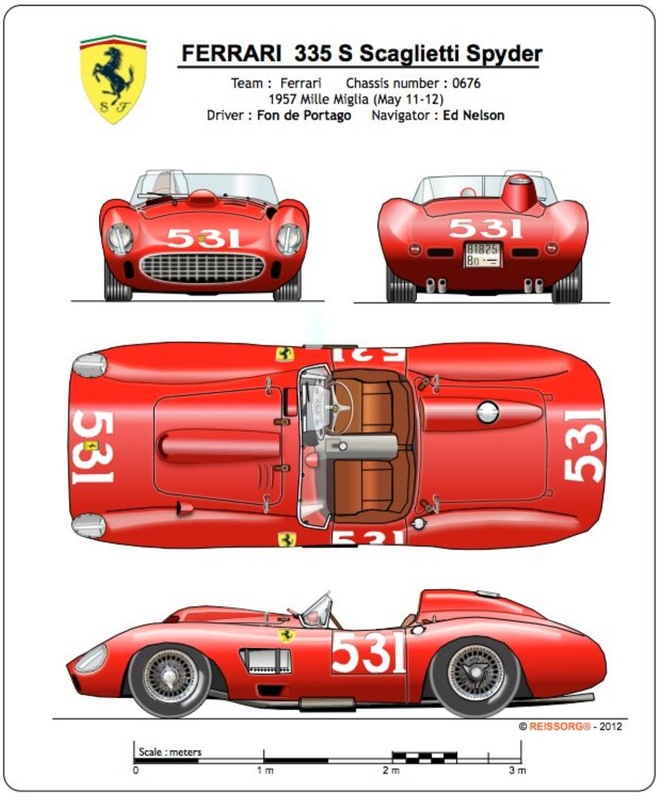 The 1957 Ferrari 335S…was a development of the 860 Monza and 290 MM sports racers of 1956. 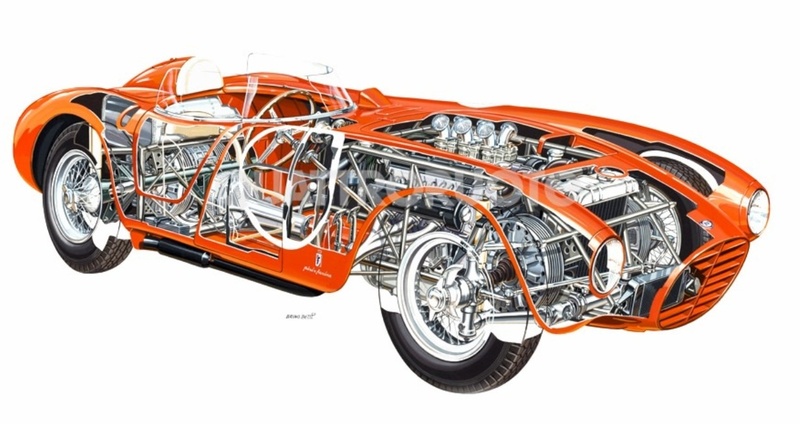 A tubular steel chassis frame was fitted with independent unequal length wishbones, coil springs and hydraulic shocks at the front. A de Dion rear axle located by twin radius arms, transverse leaf spring and hydraulic shocks was fitted at the rear. Drum brakes were used all round, steering was by worm and sector. 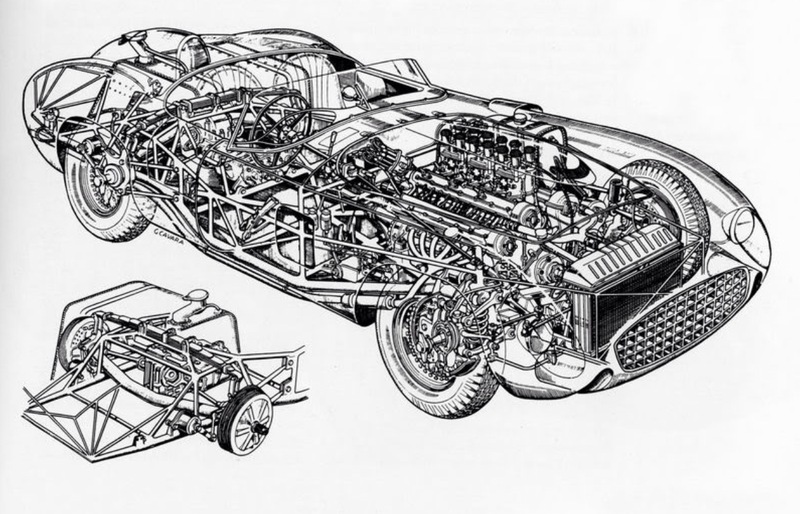 A strong 4 speed transaxle took all the torque of the big V12 with 6X16 inch and 7X 16 inch tyres fitted front/rear, the whole lot weighing a relatively light 880Kg dry. 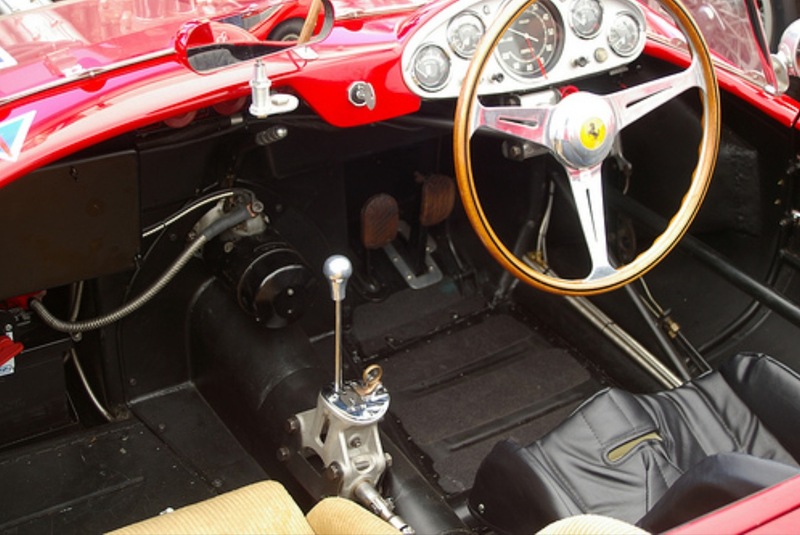 The 335 Sport was the height of development of Ferraris’ complex but powerful 4 cam front-engined sports cars which won the World Sports Car Championship in 1957, defeating arch rivals Maserati in the process. 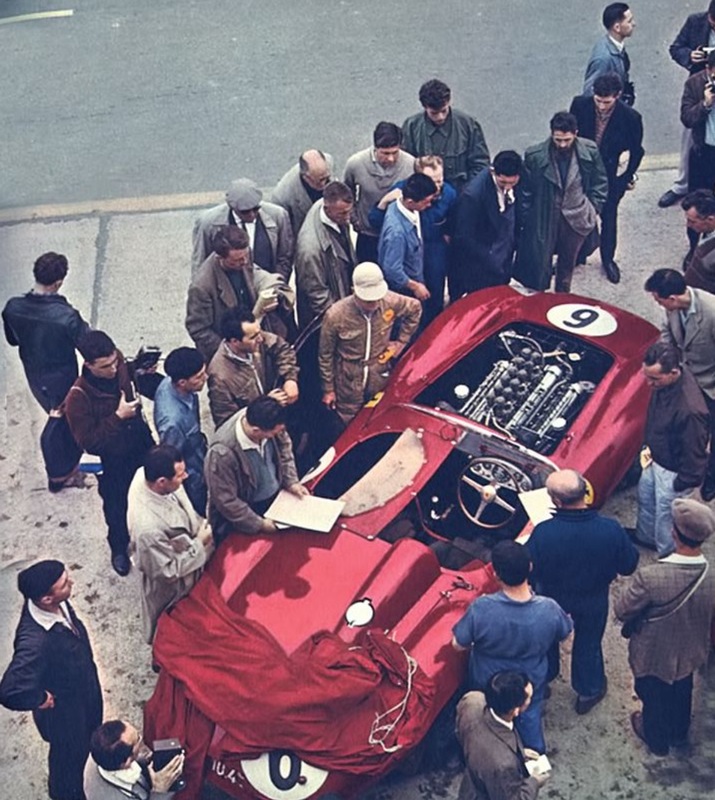 The engines of the 290, 315 and 335S were primarily designed by Vittorio Bellantani…the ex-Maserati engineer received assistance from Vittorio Jano, some elements of the engine having a passing design relationship to Janos’ fabulous D50 Lancia V8 of 1954/55. Jano of course came across to Ferrari from Lancia in the deal which ‘saved Ferrari’s bacon’, devoid of a competitive Grand Prix car at the time. The 60 degree all aluminium V12 displaced 4023cc with a bore/stroke of 77X72mm. DOHC were deployed with 2 valves per cylinder. Six Weber 44DCN carbs fed the engine with twin plugs and four coils providing the spark. Maximum power was 390bhp @ 7400rpm. 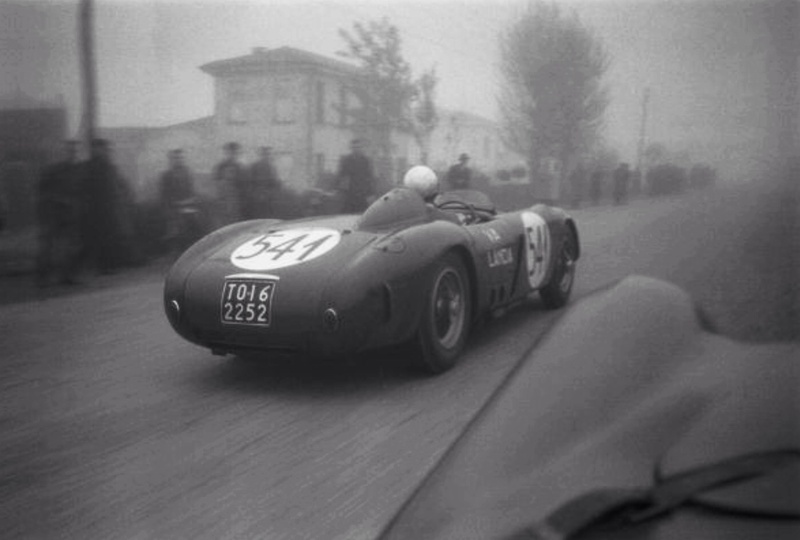 The Klemantaski Archive quotes Phil Hill as saying ‘the 335S was the best front-engined car ever built by Ferrari and certainly the fastest’.